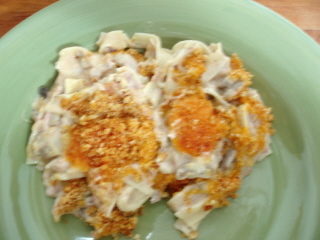 Mama has put a whole new twist on a classic recipe for tuna noodle casserole. With the addition of the cream of celery soup, the cheddar cheese and the garlic buttered croutons, this recipe takes a classic to a whole new level! Cook egg noodles in boiling water for about 8 minutes. Drain and set aside. In a large bowl, mix together the tuna, mushroom soup, celery soup, milk, sour cream, celery, mushrooms, onion powder, garlic, salt and pepper. Add the egg noodles and mix well. Pour half of mixture into a 9 x 13 inch glass baking dish. Sprinkle with half of the shredded cheddar cheese. Spread the other half of the noodle mixture on top and top with the remaining cheddar cheese. Sprinkle with the crushed garlic croutons. Bake 45 minutes. Let cool for 10 minutes before serving. 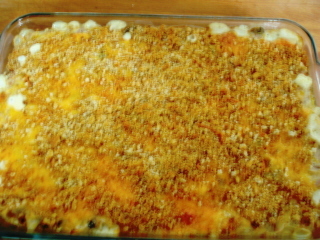 Mama hopes you enjoy this tuna noodle casserole recipe!